First published in 1988, Grammar Practice Activities is a language teaching classic. This revised version combines tried and tested activities with up-to-date content including a CD-ROM. This is an invaluable resource for any teacher who wishes to combine grammar teaching with a broadly communicative methodology. The book contains a collection of imaginative and interesting grammar practice activities suitable for a wide range of levels and ages. Clear teaching notes accompany each activity ensuring they are easy to use. In addition, the accompanying CD-ROM provides print-ready photocopiable worksheets which can be put to immediate use in the classroom. Easy-to-use grammar activities with clear teaching notes reduce lesson preparation time. The CD-ROM contains photocopiable worksheets in A4 format to print off for immediate use. 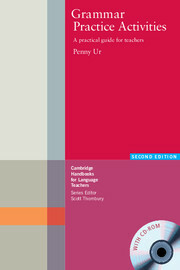 The section providing an introduction to grammar teaching is especially useful for newly-qualified teachers.